The morning after our Woodberry Kitchen dinner, we went to Jack and Zach food, which is located near my office and is one of my favorite lunch spots. Jack and Zach Food is just two guys, no other employees. But even though it is completely different in size and scale than Woodberry Kitchen, the two places are surprisingly similar. Like Woodberry Kitchen, Jack and Zach make almost everything themselves. There is a chalkboard with a list of homemade items, which includes things like their sausage and pastries all the way to butter. Making your own butter at two man operation shows true dedication to your craft. Jack and Zach has a L-shaped counter for seating, and each seat was taken when we arrived. There are scattered newspapers and books, including multiple books on how to make sausage. Eventually, two people sitting at the end closest to the door left and we swooped in, with plenty of room for our suitcase. Since restaurant is just Jack and Zach and since they want to make almost everything themselves, the menu is small. 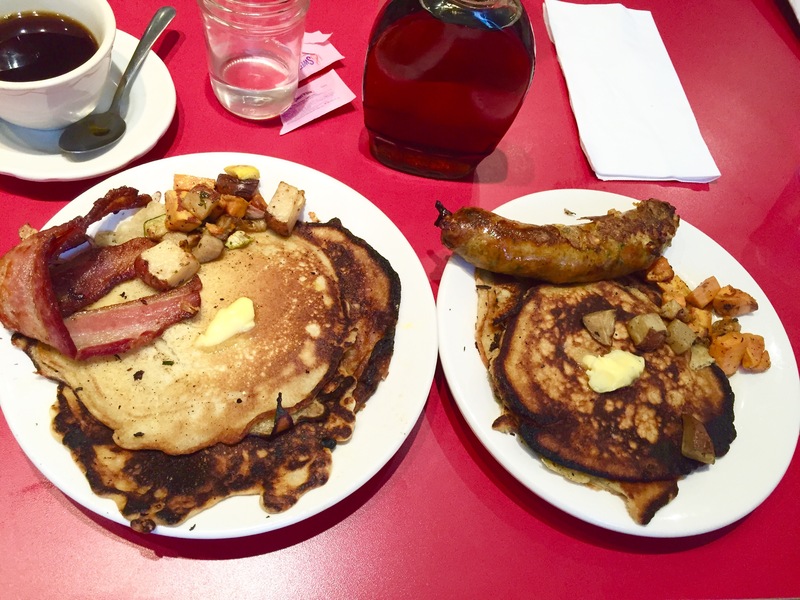 We both ordered the pancake plate, which comes with hash browns, breakfast potatoes and a side of meat. I chose their homemade curry sausage and Marnay chose bacon, which comes from Truck Patch Farms. I’ve had their bacon before and I let Marnay known that it’s one of my favorite bacons, so she was looking forward to it. To drink, we had Zeke’s coffee. Zeke’s is a local Baltimore roaster who recently opened up a small spot in the Woodridge neighborhood of D.C. The pancakes, served with real maple syrup and homemade butter, were probably the best we have ever had. They were thin and almost crispy, yet not heavy at all. They complemented the syrup because they were thick enough to avoid becoming a sponge. Instead, the syrup was more of an equal partner. Marnay’s bacon was thick, meaty and smoky–nearly perfect pieces of bacon. My sausage was juicy and had serious kick from the curry. When Jack and Zach say that their homemade sausage will taste like something, they mean it. 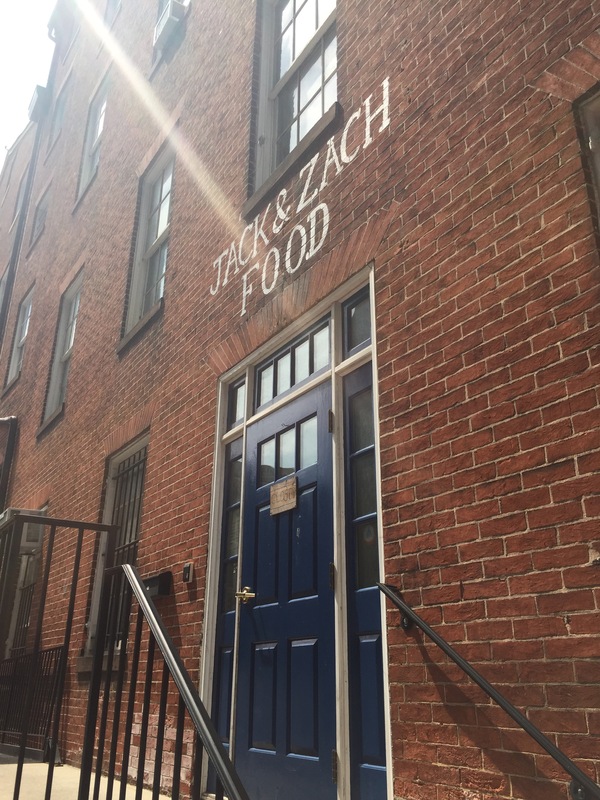 Unlike Spike Gjerde at Woodberry Kitchen, Jack and Zach likely won’t be winning a James Beard Award anytime soon. However, it’s not completely far-fetched. Jonathan Brooks at Milktooth, which is in an industrial part of Indianapolis, only serves brunch. Yet, he was named one of Food and Wine Magazine’s best new chefs for 2015 and Milktooth was named one of Bon Apetit’s best new restaurants. Jack and Zach’s dedication to what they do which is one reason I considerate it a must-try when visiting Baltimore. 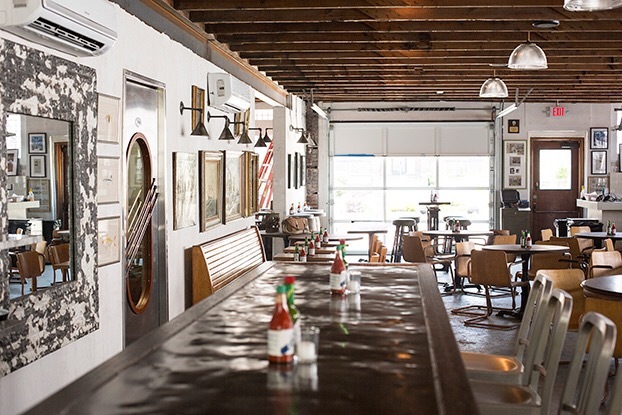 Woodberry Kitchen is from 2015 James Beard Award winning chef Spike Gjerde in Baltimore’s Woodberry neighborhood, just off the Woodberry light rail stop. The chef is almost obsessive about getting all of his products from local farms, finding products that haven’t been used in generations and then making as much as possible in-house. 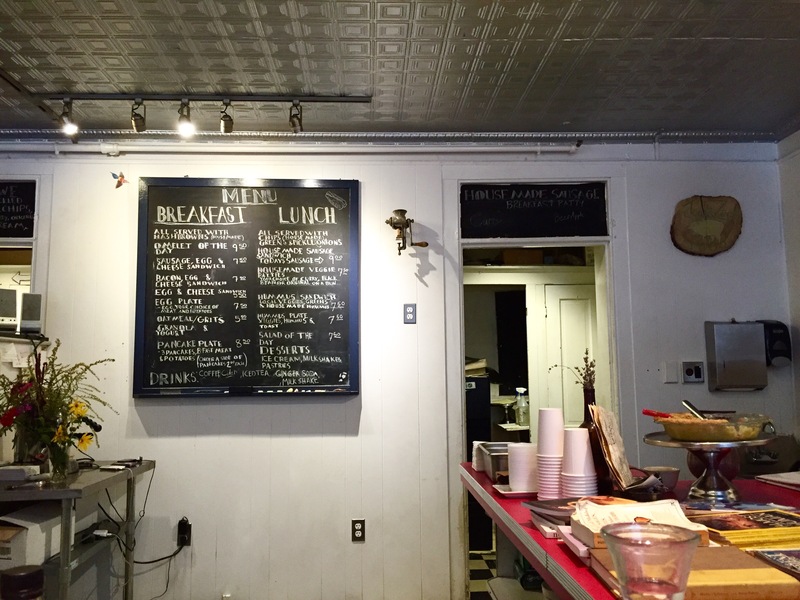 Interestingly, Woodberry Kitchen uses many of the same products and has a similar mentality to Husk in Charleston. Eating at Woodberry Kitchen was a little like being back in Charleston. The restaurant is in a huge converted barn, with multiple levels of seating plus an outdoor patio. Our table wasn’t ready when we arrived, so we waited outside around a fire pit. It was a breezy, overcast night, so the fire pit was welcome. We ordered one snack and one small plate as our appetizer. We considered making a meal out of small plates, since usually all you need is a few bites to fully appreciate a dish. 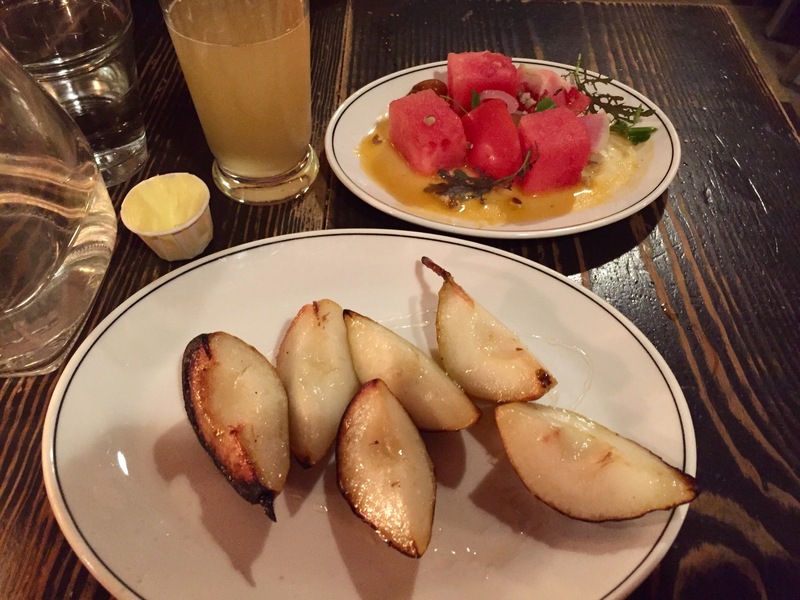 Our “snack” was Bartlett Pears Out of the Oven, which was Bartlett pears cooked in the wood oven and then drizzled with alfalfa honey and hillbilly salt, also known as seasoned salt. I think that we both agree that this was our favorite dish of the evening. We had been looking forward to ordering it and were hoping that it would still be on the menu. We also ordered the Watermelon Salad, which had Heirloom tomato, black walnut, pickled watermelon rind, watermelon dressing and apricotta. The apricots added great sweetness to the dish, especially when eaten with the acidity of the tomatoes. 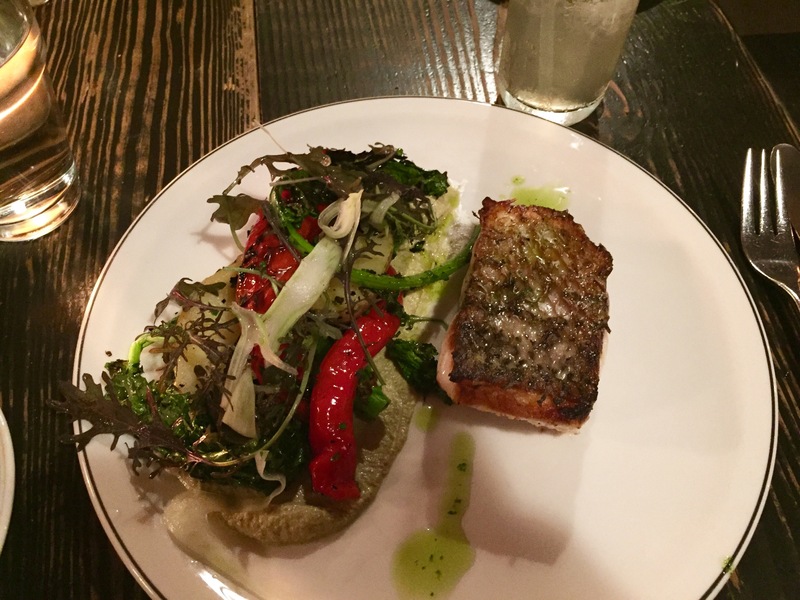 For our main courses, Marnay had Maryland Rockfish Out of the Oven, with roasted La Ratte potatoes, Jimmy Nardello peppers, fennel, peanut dressing and pepper jam. The wood oven roasted rockfish and the peanut dressing went very well together. 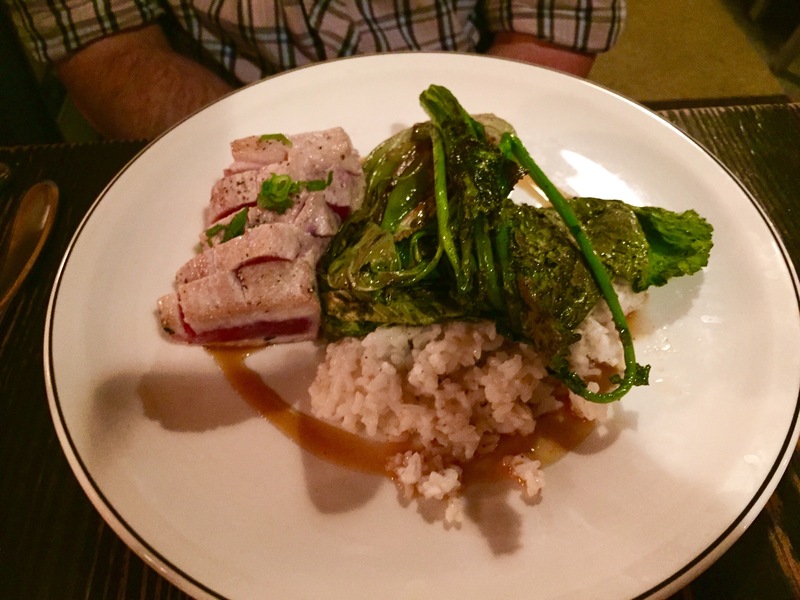 I had Cape May, NJ Yellowfin Tuna with buttered Carolina Gold rice, roasted haricot vert, red-chile shire sauce (worcestershire sauce) and benne seeds. Carolina Gold rice and benne seeds are two quintessential Charleston ingredients. Woodberry Kitchen was similar to Husk, but better on all levels (in my opinion). Which is good because it’s a heck of a lot closer to us! I ordered the tuna rare, with enough searing on the outside to form a crust. It was hands down the best looking piece of tuna that I’ve ever seen, and it tasted just as fresh. No doubt my favorite piece of tuna ever. 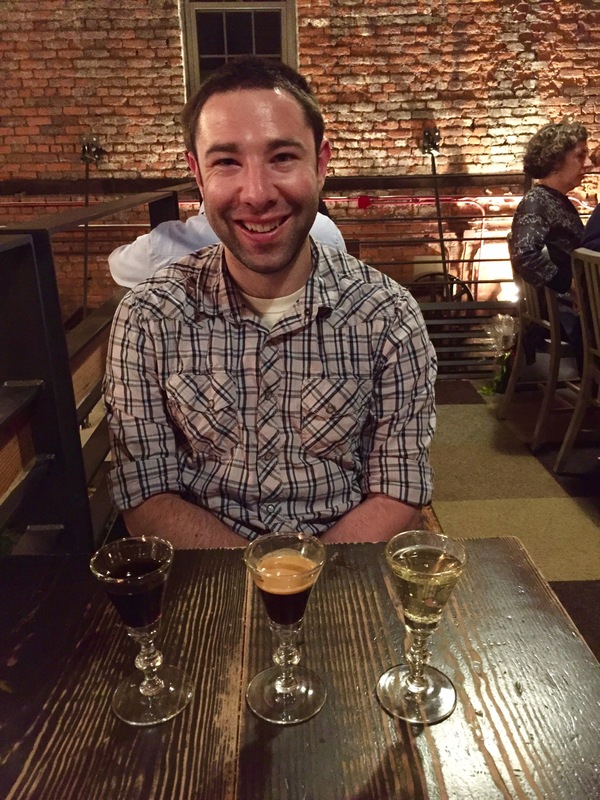 As an end to our meal, we had a liquid dessert called “The Clean Slate.” It consisted of a shot of Distillery Lane Celebration Cider (another local cider), a shot of espresso and a shot of Fernet, taken in that order. We shared the shots, each taking half a shot each. The “Clean Slate” was one of my favorite endings to a meal ever. Another ending to a meal that sticks out in my mind as being special was our birthday dinners at the Kitchen at Rock Hall. Since we can’t go back there again, Woodberry Kitchen will certainly do! We took Amtrak to 30th Street station in Philly on a Saturday morning. When we arrived, we went with Marnay’s Mom to Dim Sum Garden, which is in Philly’s Chinatown. 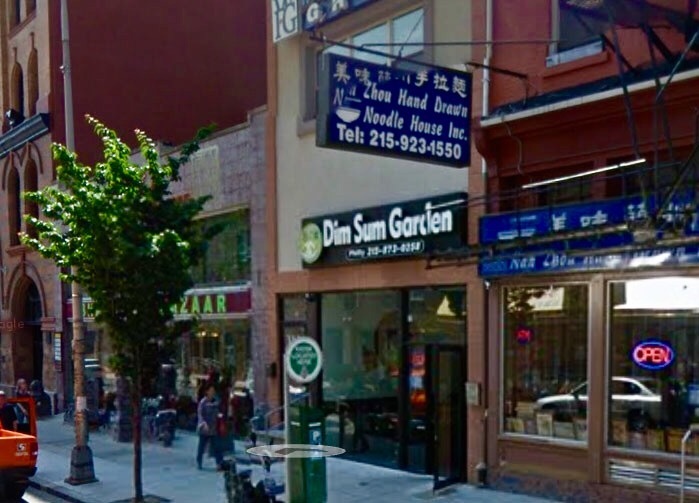 Dim Sum Garden is one of the places that Tom Sietsema went to on his recent trip to Philadelphia. We had a little trouble navigating the narrow streets of Chinatown with our rolling suitcase, but we eventually found the restaurant. The place was packed—always a good sign. They shoved in a very tight space. To get into and out of our seats, the people next to us actually had to get up to allow us to pass. Dim Sum Garden is known for their soup dumplings. We were excited because we have never had soup dumplings, although we have heard a lot of about them. Dim Sum is still relatively new to us. We weren’t introduced to it until we moved to Maryland since it isn’t that popular in New Jersey. The three of us ordered what seemed like a lot of food, but which ended up being quite reasonable. We ordered steamed pork soup dumplings, steamed shrimp dumplings, steamed vegetable buns and sweet red bean cakes. Red bean cakes are one of our favorite treats, and they were as decadent as expected. 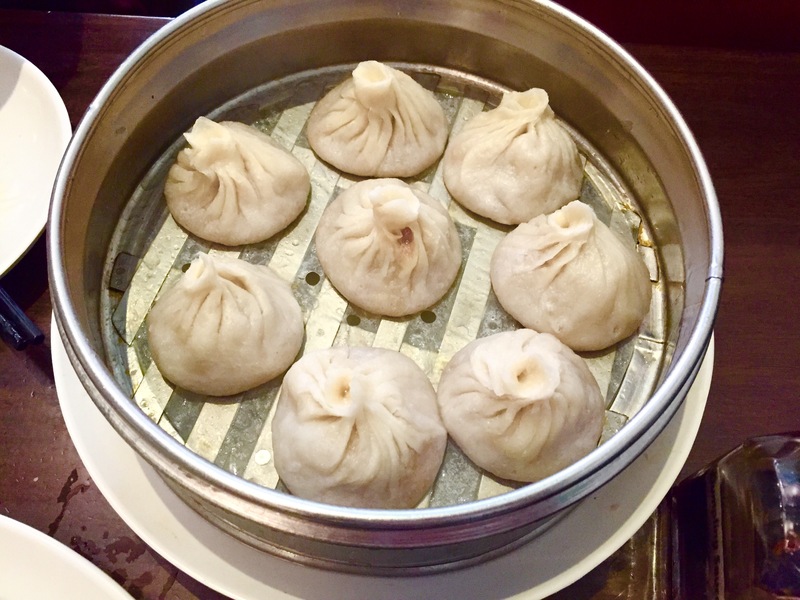 None of us had had soup dumplings before, so we had no idea how to eat them. One method was to just put the whole thing in your mouth. That was delicious, but there was more broth than I expected! The other method was to pierce the dumpling with a chopstick (no forks at this place) and just use the broth as a dipping sauce. Both methods were good! The shrimp dumplings tasted extremely fresh, as did really everything at Dim Sum Garden. It’s usually a safe bet to go to a Dim Sum Place on a Saturday afternoon, since that’s when they are busiest. 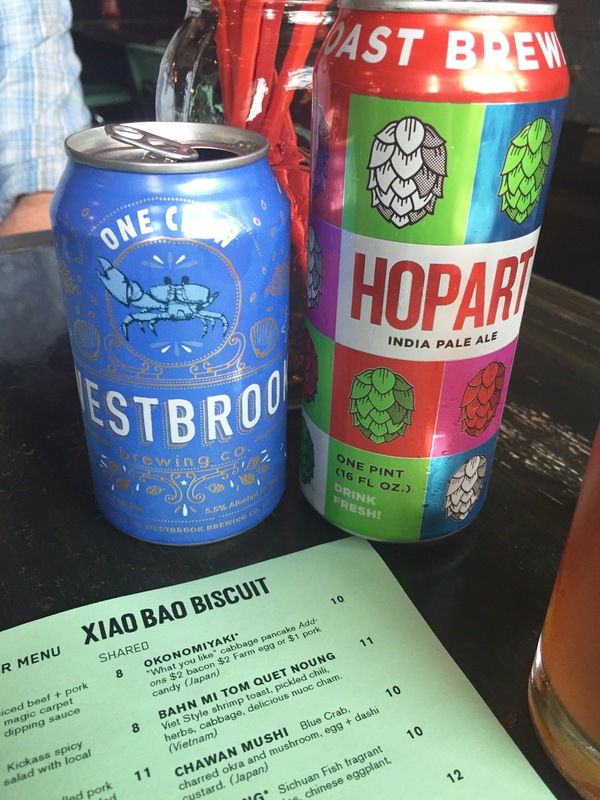 We now have a new favorite in Philly’s Chinatown! For our last dinner in Charleston, we went to Leon’s Fine Poultry and Oysters. Two days before we left for Charleston, Leon’s was named one of Southern Living magazine’s best restaurants in the South. Husk was on the list as well. Leon’s is another restaurant that doesn’t take reservations, so we had an early dinner. It was pretty crowded when we got there, and they stuck us in the corner. We were near the large garage-style doors, and it would have been nice if they were open. However, it was raining that day. The food, though, was another story. We started off our meal with oysters from Prince Edward Island and Massachusetts. I thought it was a little odd that there weren’t any local oysters, but then again I’ve never seen oysters from the Carolinas on a menu. 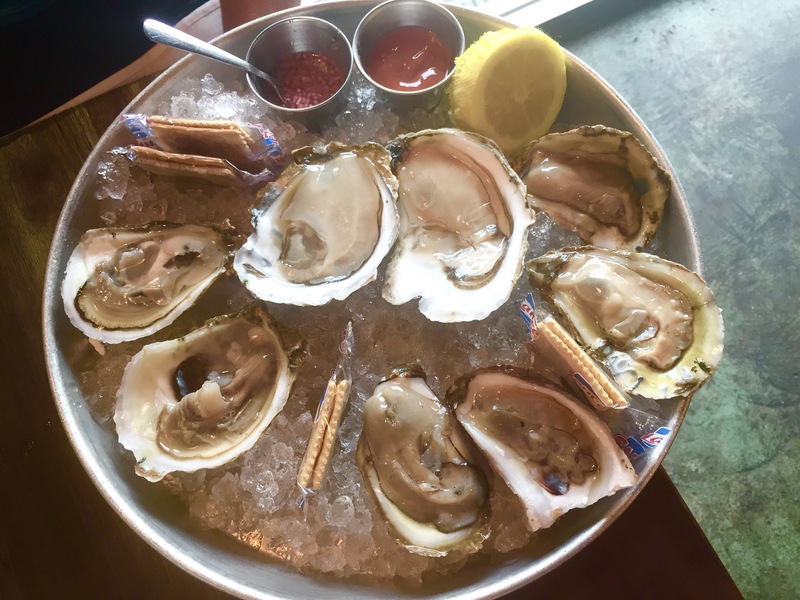 The one oyster that stood out was called “Cooke’s Cocktail”, from PEI. They were huge!!!! But they also had the most interesting flavor. They were surprisingly salty for an oyster that meaty. Our main course was fried chicken with a side of brussel sprouts. The brussel sprouts were fried and were cooked with red wine vinegar and piperade, which is a Basque condiment of onions, green peppers and tomatoes sautéed with Esplette pepper. The brussel sprouts were slightly crispy from being fried lightly, they had a tang from the red wine vinegar and they had a kick from the Esplette pepper. It was the best version of brussel sprouts that we’ve ever had. They were incredible! We each got two pieces of fried chicken: Paul had two pieces of dark meat and Marnay had two pieces of white meat. The chicken was very hot when it came to the table, like it was right out of the fryer. 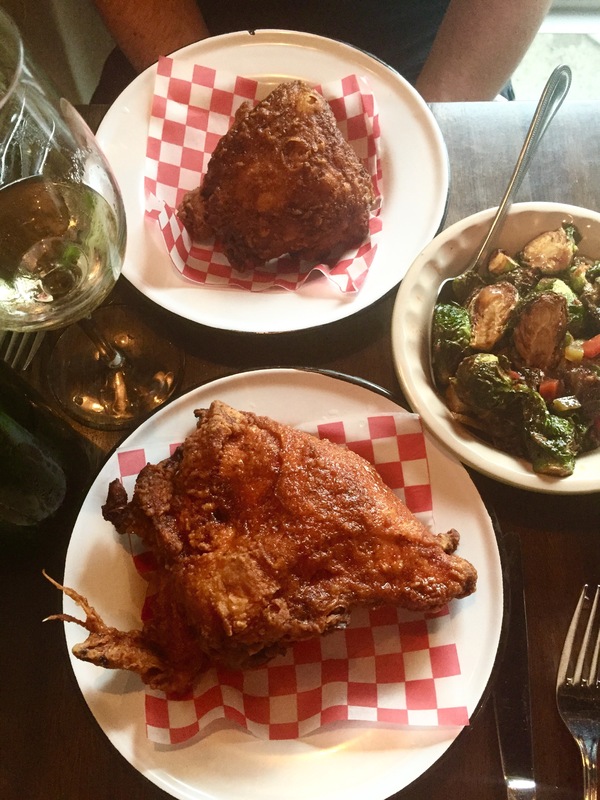 Fried chicken is easily the most popular dish at Leon’s, so I’m sure they make a ton every night. The chicken was served in a small plastic basket with red and white checked paper beneath it-very casual. The skin was SO crispy. It tasted like it had been fried twice, similar to Korean fried chicken. When we started eating it, we were surprised that it was quite spicy. I smelled it when it came to the table and noticed that it smelled like Old Bay. I asked the server and sure enough, it was Old Bay. The chicken was absolutely amazing. I (Paul) think that it was my favorite dish of the trip. My mouth is watering while I type this! 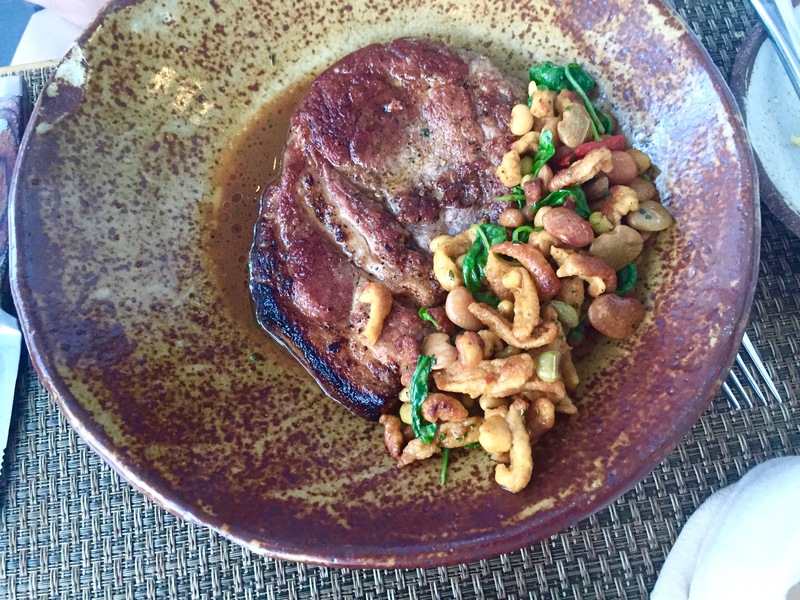 Overall, the food at Leon’s was excellent; the atmosphere leaves something to be desired. When you compare it to Xiao Bao, Xiao Bao wins on atmosphere alone. But my mind keeps coming back to that fried chicken!! We left for Xiao Bao Biscuit around 5pm, because they did not take reservations. Halfway there, we got caught in a torrential downpour. Even with umbrellas we were soaked, so we took an Uber the rest of the way. 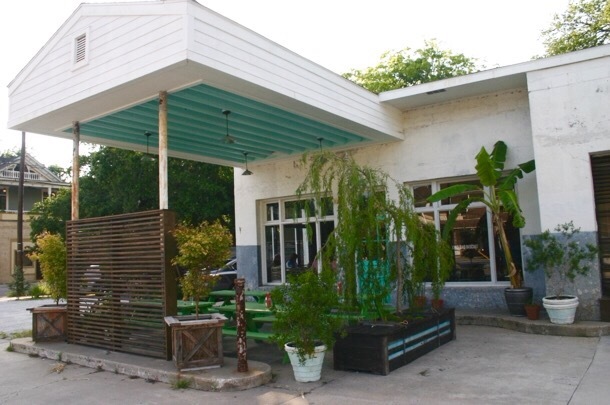 Xiao Bao is in a former gas station and auto repair shop. Where the pumps used to be, are now outdoor tables. The inside has a cool, industrial feel. 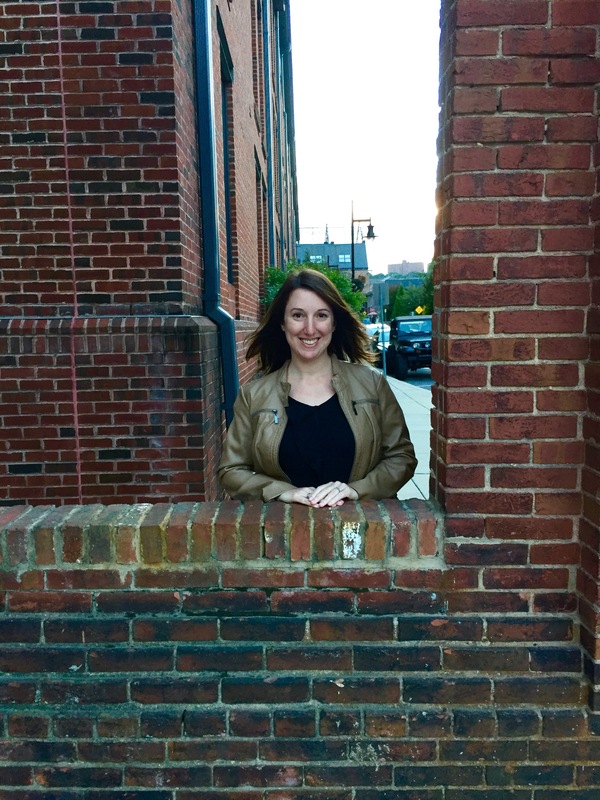 We felt right at home as soon as we walked in because it reminded us of a place we would find in Silver Spring. We started the meal with two local beers, Paul had a Westbrook Rye Pale Ale (from Mount Pleasant) and Marnay had a Coast IPA (from North Charleston.) The theme of the restaurant is Asian comfort food, this being a restaurant in Charleston and all. There are dishes from China, Japan, Thailand and Vietnam. 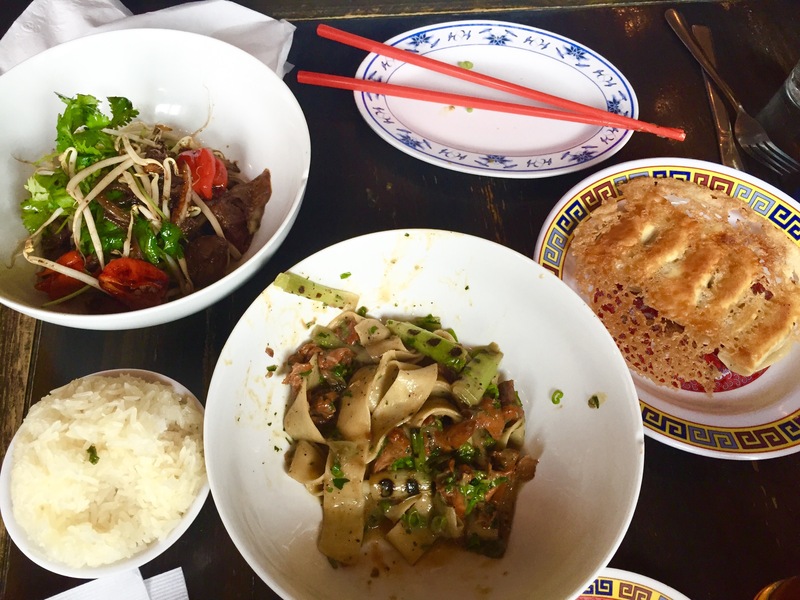 It’s a small plates restaurant, and we ordered three dishes from China to share. All three dishes were amazing. The price point is very reasonable, and it’s a fun, hip environment with great music. Of the three restaurants in Charleston that we went to for dinner, this is the one we would go back to over and over. 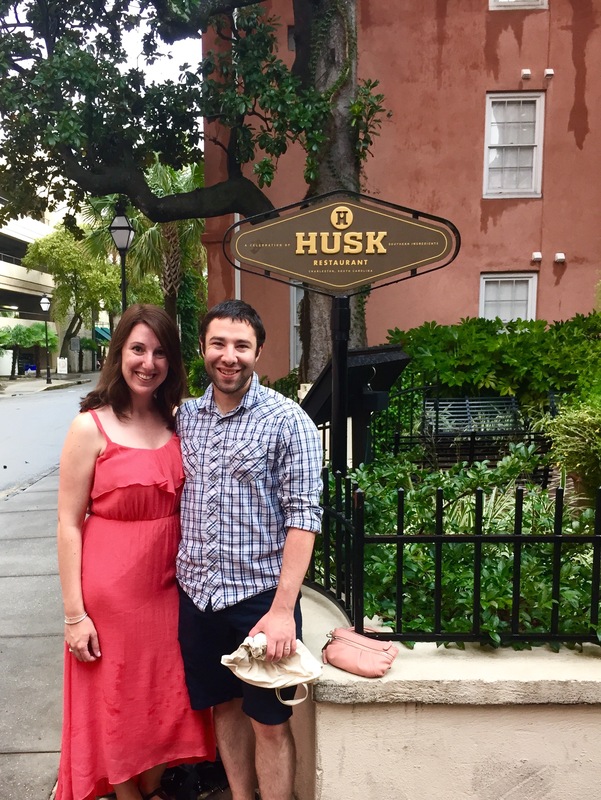 The night that we flew in to Charleston, we went to Husk. Husk is probably the best restaurant in the South, and likely one of the best restaurants in the country! 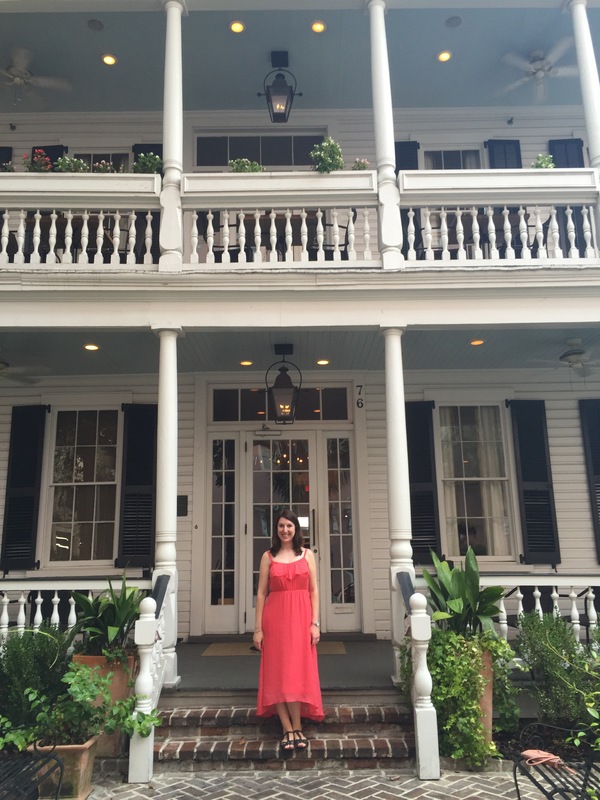 The restaurant is in an historic mansion which was owned by a member of the Pinckney family, who were very prominent in the history of South Carolina. We had a reservation at 10:15, but we preferred to eat earlier. Husk allows a limited number of walk-ins, so we arrived at the restaurant at 4:30 for their 5:30 opening. We were the only ones there. Turns out that lining up outside restaurants before they open is not really a thing in Charleston. Luckily, Husk bar, next door, was open. The bartenders were both extremely knowledgeable and friendly. I had an Elijah Craig 12 year and Marnay had a “Charleston Light Dragoons Punch,” with the recipe from the Charleston Preservation Society. At 5:00, we left to stand outside the restaurant. There were two other parties, and we ended up talking with them. One guy was a flower wholesaler from California who sold to Trader Joe’s. Another guy was from Northern Virginia, although his parents lived near Charleston. The “walk-in” section was the upstairs outdoor patio, and it really is the best seat in the house. Husk organizes their wine list by soil type, which is a great idea. Gives you an idea of the “terrior” of the wine, the indescribably quality that comes from the earth in which the grapes are grown. 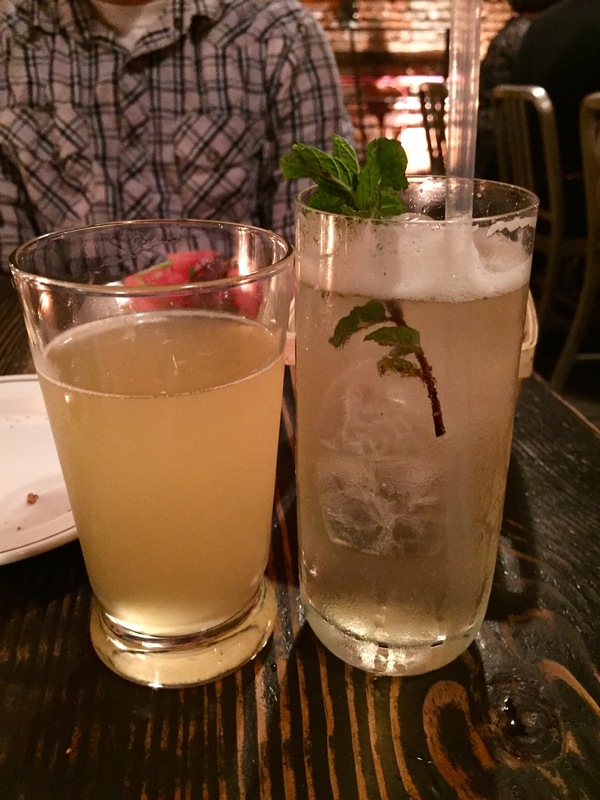 Husk also focuses on pre-Prohibition Southern dry ciders. Marnay had one “volcanic” wine and one “limestone:” a chardonnay blend and a sauvignon blanc. The chardonnay blend was here favorite. I had two ciders, the second of which was combined with apple brandy and tasted almost like a port. 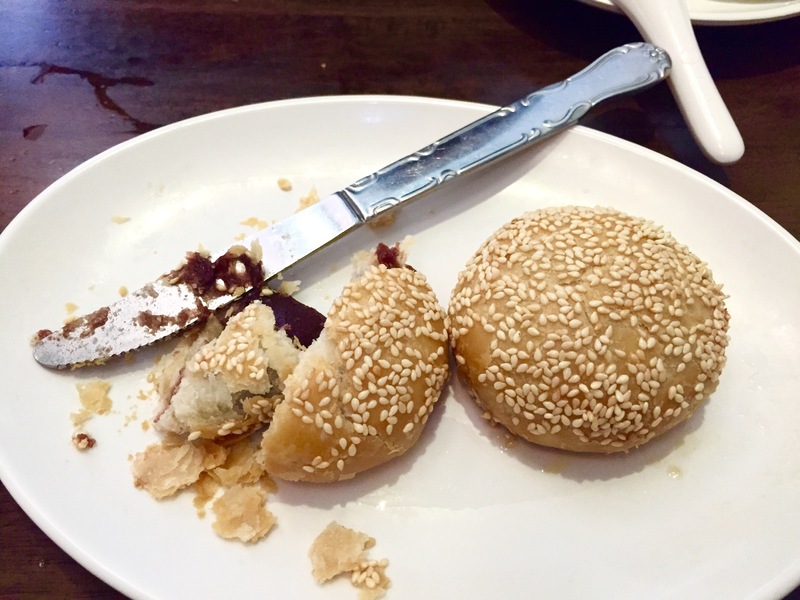 Once we received our drinks, the server brought us homemade benne seed rolls with pork honey butter. They were absolutely delicious, and actually one of my favorite parts of the meal. The salad we started the meal with was one of the best salads we’ve ever had-maybe the best. All the ingredients came together SO well. The freshness of the local grilled peaches and the blueberries were balanced by the crispy ham. The Cheerwine vinaigrette could have been overpowering with sweetness, but it was subtle. 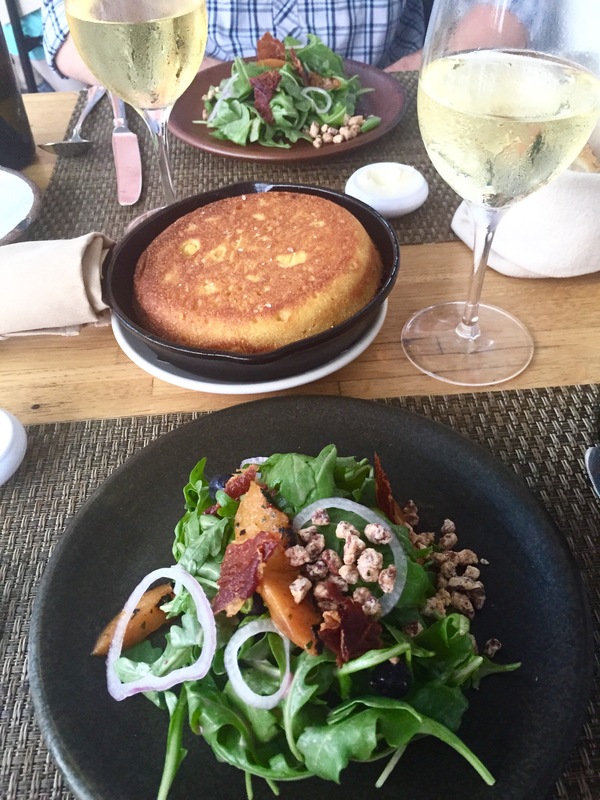 On the other hand, the Benton’s bacon cornbread was disappointing. There was virtually no bacon. 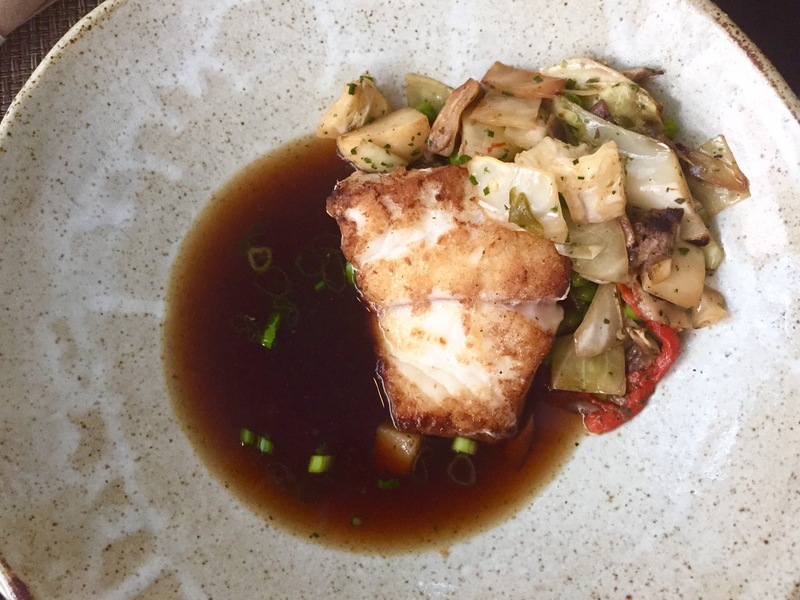 Marnay’s main course was local grouper in a mushroom “tea.” Husk gets all of their fish from one fisherman. He goes out into Charleston Harbor in the morning, catches the fish, and the restaurant serves it that night. I had Heritage Spot Pork from a farm in Florence, SC. Husk specializes in pork, so I had to get it. It was delicious, and it came with pot likker, which is the liquid the collards are cooked it. That stuff was so smoky and savory. We were too full for dessert, so after dinner we walked home and went to sleep after our long day. 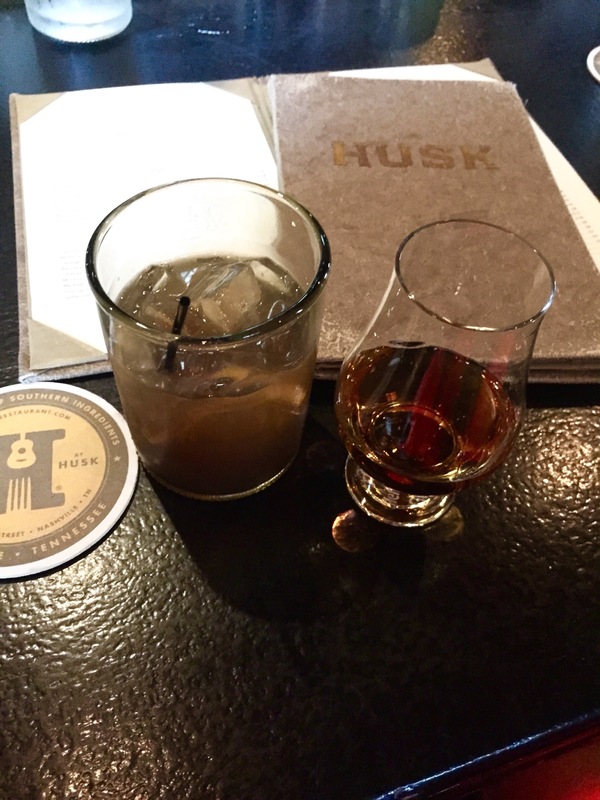 Overall, Husk lived up to expectations!